Animals to look out for in Samburu.. The gerenuk is an Antelope and gets the name from its exceptionally long neck. Gerenuk means “giraffe necked” in the Somali language. You can find the Gerenuk in habitats with woody vegetation including the dry and flat thornbush and thickets. The gerenuk’s head is small for its size and its eyes and ears are large. 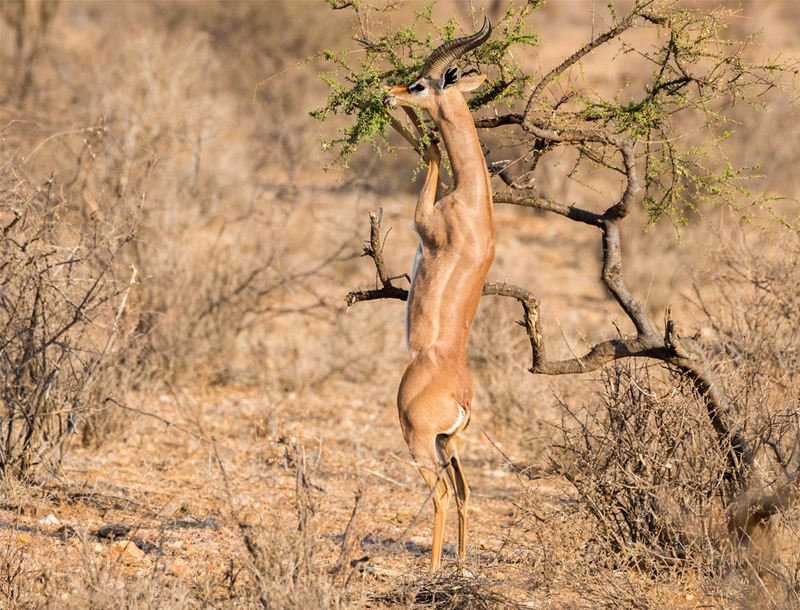 Unlike other gazelles and antelopes, the Gerenuk eats standing on its hind legs to browse tall bushes. The largest living bird on Earth; the Somali ostrich is a large flightless bird native to Djibouti, Ethiopia, Kenya and Somalia. The Somali ostrich was identified as its own species in 2014. Prior to that it was considered a subspecies of the common ostrich. The two ostriches are virtually identical with the main differentiator being the colour of their legs and necks; the common ostrich has a pink neck and pink legs whereas the Somali Ostrich has a pale blue neck and blue legs. Male and female Somali Ostriches look quite different; males are black and white, whereas females are brown and much smaller than males. Their survival is continuing to decline with a variety of threats including hunting for feathers and food, egg collection, habitat loss and land degradation. One of the most recognisable species of giraffe, the reticulated giraffe, is characterised by its brown-orange patches clearly defined by a network of striking white lines. Like other giraffes, reticulated giraffes are rarely preyed upon because their long necks aid them in spotting threats from far. However, lions, crocodiles and spotted hyenas sometimes prey on juveniles. There are approx. 8000 left in the wild. The most prominent threat to the reticulated giraffe species, is hunting by humans for the giraffe’s skin and hair. The long-legged Grevy’s zebra is the largest living equid (horse) in the world. They are distinguished by their narrow stripes and white bellies. Today, the Grevy’s zebra is Africa’s most endangered large mammal and now, can only be found in northern Kenya and southern and eastern Ethiopia. Threats to the population were once prominently hunting; however now, it is believed that loss of habitat and drought are the main threats. The Grevy’s zebra is fairly water dependent, but can go up to 5 days without it. However if lactating, female Grevy’s zebras must drink at least every other day in order to maintain milk production. With land degradation worsening each year, the distance between available grazing and water increases, meaning that the long and frequent journeys that Grevy’s zebras with foals have to make, results in high foal mortality. Also known as the beisa oryx, the East African Oryx is part of the Oryx genus of 4 different species, three of which are native to Africa. You can find the East African Oryx in Ethiopia, Somalia, North-eastern Uganda and Kenya. The oryx is a large antelope with long, spear-like horns. It’s a desert animal, with a thick, horse-like neck; a short mane; and a compact, muscular body. The Beisa Oryx looks very similar to the gemsbok (Oryx gazella), and was once considered a subspecies of the gemsbok however the two have a different diploid chromosome count. The east African Oryx population is declining with poaching (for meat and hides) and encroachment by settlement and livestock being the major threats, especially because the majority of the population are situated outside protected areas.